Celebrate early Texas struggles with this framed Alamo flag for your office or home wall decor, one of the framed Texas flags from our Texas History art collection. The Texas Alamo was originally founded by the Spaniards as Mission San Antonio de Valero during a time of tension with the French in 1718. Fast forward to March 1836: a group of Texans, weary from failed attempts for adequate representation as a Mexican territory, take their stand behind the walls of the Alamo. The Alamo flag tricolors match Mexico’s green, white and red. This was the flag in force over the Texas territory during 1824, a date which refers to the Mexican constitution passed during that year. Interestingly, there is some question as to whether this flag actually flew over the Alamo during the 1836 siege against a superior force of 6,000 Mexican troops. In any case, in his famous painting Dawn at the Alamo battle print, artist H.A McArdle shows the Mexican flag of the 1824 Constitution lifted up over William Travis and his brave band of men. This flag is now popularly celebrated with that heroic effort for Texas independence. The outcome of the battle resulted in an unquenchable fervency for the Texas cause, leading to cries of “Remember the Alamo” and “Remember Goliad”. The astounding defeat of the Santa Anna forces at San Jacinto on April 21, 1836, enabled the birth of a new nation: the Republic of Texas. This 1824 Alamo flag is handmade embroidered cotton. The 24 x 36 Alamo flag is hand stretched and comes set in a custom stained dark barnwood frame made in Texas measuring 28 x 28 inches. 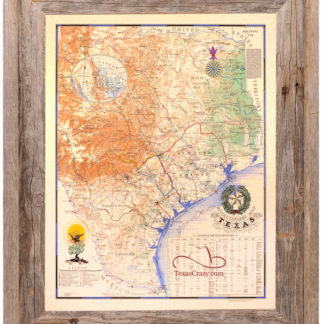 Or choose an oversize 3 foot by 5 foot flag set in a 37 x 61 inch barnwood frame.